We all now the song as we all know Easter. 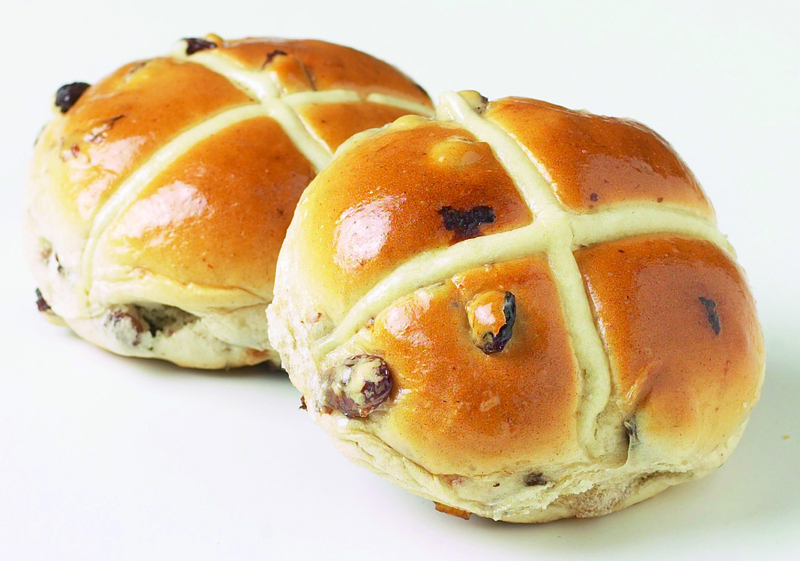 But what is Easter without the traditional hot cross buns…..well it’s like Christmas with no presents, like a Birthday without the cake. Inspired? OK then let’s get started. For this recipe, I have used the water roux method to get more softer results! Mix water and flour and stir until all the lumps break. Cook the mixture until it thickens and coats the back of a spoon. Allow it to cool before you can use it. 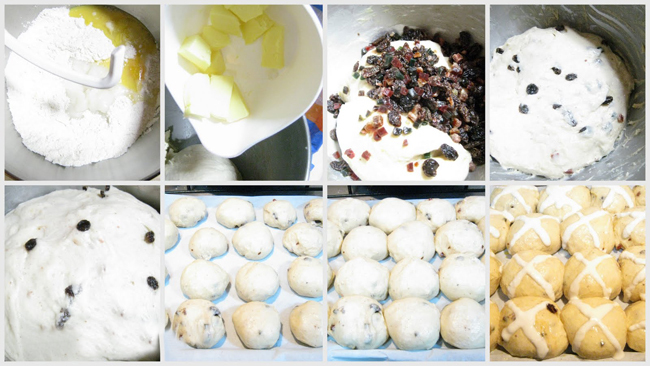 Mix all the ingredients together except butter, raisins and the candy peels. Knead the dough until its soft and elastic for 10 minutes. Knead in the butter and the dry fruits. Allow it to rise for 2 hours. Divide the dough into 18- 20 portions and arrange on a parchment paper. Cover and allow it to rise until double in size around 30-45 minutes. 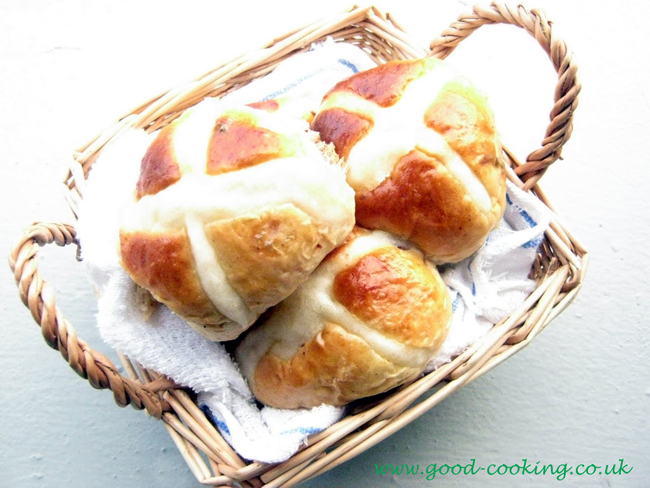 During the last 10 minute of the rising time preheat the oven to 180 degrees C.
Use half of the egg add a bit more water and apply on the rolls. 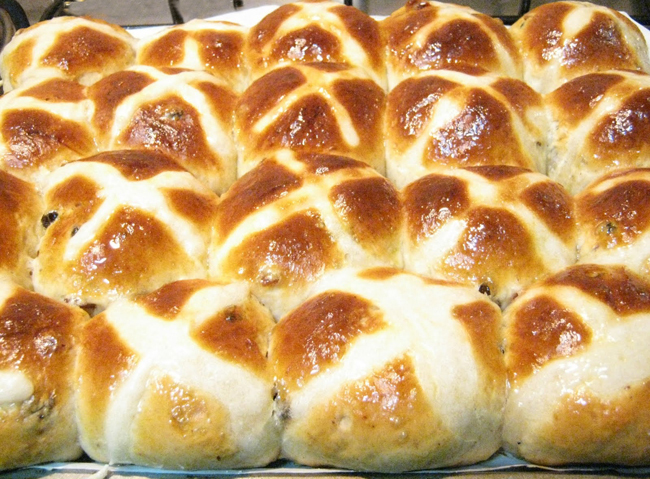 Draw the cross and bake for 15-20 minutes until it’s done. Soon when it’s out from the oven apply the sugar Syrup to give it a glossy look. Allow it to cool on wire rack before you can store them in a container. Mix to get a smooth dough. Fill into a plastic bag and make a small opening at one end so that the paste flows and you can draw the cross easily. Boil and allow it to cool down before you can brush it on the prepared rolls. Христос Воскресе, Häid lihavõttepühi, Καλό πάσχα, Wesołych Świąt Wielkanocnych!, Христос воскрес, ¡Felices Pascuas!, Paşte Fericit.